ambassador to the UN said. sanctions on Russia over its continued support of Syrian President Bashar-al Assad . 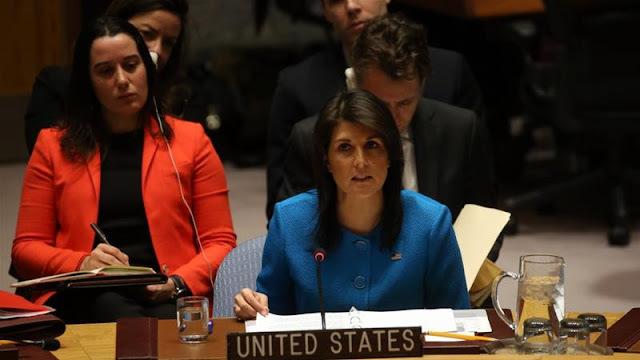 on Monday, Haley said on CBS. chemical weapons use," she said. US over the Syrian crisis . facilities of Assad's government early on Saturday. rebel-held Damascus suburb of Douma. The White Helmets, a local civil defence agency, accused the Assad government of carrying out the gas attack, which is believed to have killed 85 civilians, including children, and injured hundreds of others. The US and allies say they have evidence that the attack was carried out by Assad's forces. In response, Russia pledged to retaliate for what it described as a "fabricated" chemical gas attack.